Is anyone else creeped out at the fact that the Once-ler is attractive?? Who was your Favorit character? Did Du cry when Du saw The Lorax? Die Fanauswahl: No,I was brave!!! Who is the character that Du hate? Die Fanauswahl: Yes! I Like It! No! I Like The Original One! Note: This review is dedicated to Dr. Seuss. 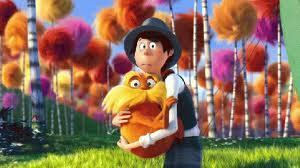 The Lorax is a 2012 animated film that was made Von the people that made Despicable Me. The film has 2 plots: 1 plot takes place in the past. That storyline is about the Once-ler, a human who wanted to use trees to make a product to sell. He tries to not hurt the trees to avoid angering the Lorax, but the Once-ler's mom gets him to ruin the forest. The other plot is about Ted, a human boy who wants to save trees, but the Mayor wants to stop him. Hi guys, I can't believe that it's been coming to 2 years since I watched this film with 3 of my classmates! So, here is my review. Okay, when I first watch this, my first impression was that it was like Avatar and Ferngully, mainly because the 3 films are trying to promote environmentalist. To which I can't blame them for getting inspiration from this film, and I truly appreciate that! However, the film is very to preachy on how they promote their message. This is the one thing that I am annoyed with this film! How bad can I possibly be? This is it! This is the place! Excuse me while I rip these out! a photo Wurde hinzugefügt: Du okay there Lorax? a comment was made to the poll: who cute???????? Who makes "The Lorax's" voice?